The global business community is experiencing rampant growth at a rate of ten percent per annum. That means your company needs the tools and services to compete with ten percent more competition each year, and the most important tools in your arsenal should be a robust Enterprise Resource Planning (ERP) system coupled with the most agile and feature-rich ecommerce system available Magento. What is ERP? It is an enterprise-wide information management system that can optimize efficiency. Magento Integration with your ERP can help your organization meet the challenges of today and tomorrow with confidence that you can adapt to changing business conditions and increased competition. What is Magento? Magento is the open source ecommerce application that has led the industry in innovation and service with features like mobile templates, loyalty programs, shopper segmentation, transaction options, product display options and multi-site functionality. Adding these features to your business can create a dynamic synergy which grows both your online business and your brick-and-mortar operations. The importance of integrating your Magento and ERP systems lies in the ability to seamlessly meld online transactions with organizational processes like product management, logistics and research & development. Microsoft Dynamics: By integrating Microsoft Dynamics AX, Microsoft Dynamics GP or Microsoft Dynamics Navision with Magento through customized connection products like AX Connect, GP Connect and NAV Connect, i95Dev has made ecommerce integration an easy to manage, inexpensive process. Microsoft Dynamics and Magento integration has never been more accessible to small and midsize companies. QuickBooks: QuickBooks and Magento Integration allows your organization to combine the accounting features of QuickBooks like sales tracking, tax expenses, and banking information with the power of North America’s leading ecommerce platform. Infor: Infor and Magento integration is a low cost and minimally disruptive operation that will improve your operational effectiveness. Magento recognizes the prominent place that Infor holds in the ERP industry and has engineered its platform to easily integrate with their ERP systems. SAP: i95Dev has created a system for seamless SAP integration with Magento that enhances this world leading ERP application through a robust online commercial operation. Your ecommerce sites will utilize real time integration to monitor warehouse inventories, payroll and accounting information based on SAP’s powerful database systems. Epicor: As an ERP industry leader, Epicor products have become a widely used management system for companies around the world. I95Dev recognizes Epicor’s importance in the business community and has developed a system for Epicor integration with Magento that combines Epicor’s rich management system with Magento’s online capabilities. Oracle (Endeca): Oracle (Endeca) integration with Magento allows your company to maintain the user-centric buying experience across online, in-store and mobile channels while boosting your online operations through unique and powerful features. Ecommerce integration is only successful if the best elements of your ERP system and your ecommerce application reinforce one another. The real time information that is critical to making sales through your online portal must be readily available, just as the latest transactions are processed through the proper logistical and delivery channels. 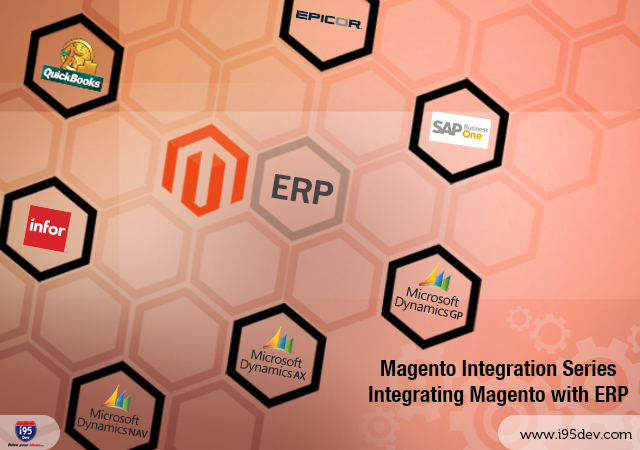 The integration applications by i95Dev can bridge this divide between online and ERP systems with industry leading applications like Magento AX Connect, Magento RMS Connect and Magento GP Connect. Multiple channels: If your company has operations that span multiple brick and mortar sites, warehouses and an online store, then you need the powerful integration products that i95Dev offers to maintain a comprehensive and up-to-the-minute overview of enterprise wide processes. With real time integration, your floor salespeople will have the latest pricing and availability information at their fingertips. Increased B2B sales: With i95Dev’s integration tools, your in-store and online operations will be able to identify business customers that rate a discount or special purchasing options. This personalized service should strengthen those relationships that are most profitable. Enhanced customer service: The increased transparency of your organization’s operations will allow you to deliver more customized service that satisfies your consumer’s specific needs. Not only will your personnel have access to real time information, but they can recognize bottlenecks in inventory more readily. Diminished costs: Integration of ERP with ecommerce applications allows your organization to maintain a 360 degree view of all operations which leads to greater efficiency and helps your managers identify issues early. Reduce risk: With the latest integration tools, your organization can recognize impending challenges on multiple fronts including local, national, or global markets. Your strategic development can include all aspects of you enterprise and limit exposure to risk. I95Dev is a widely heralded leader in powerful integration applications with extensive experience in B2B and B2c operations. Serving more than 1,500 clients around the world, i95Dev is one of the global business community’s most trusted authorities on CMS, ERP, and OMS integration.